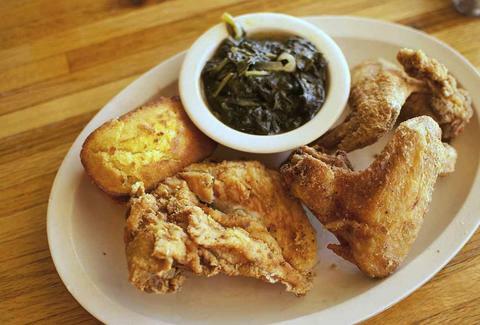 Second only to barbecue as the most well-known of Bluff City cuisines, Southern-style soul food is all about succulent sides like greens, macaroni & cheese, yams, biscuits, and cornbread. But the foundation of all of that goodness is the ultimate Southern menu item: glorious, finger-licking, golden, crispy, juicy, fried, God-bless-Memphis chicken. Here are the 11 essential spots to get you some. For once, a sign claiming that a restaurant is "world-famous" is actually true. 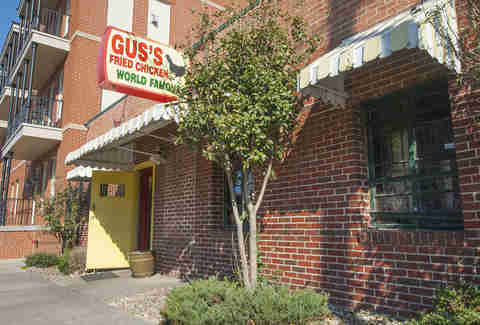 Gus's World Famous Fried Chicken has been on every essential Memphis food list, best fried chicken list, and extreme-food TV show there is. Soon this carefully guarded Memphis-area-original family recipe will be served in spots like Chicago, Philly, and LA, along with the existing 10 locations now offering the spicy, crispy, succulent chicken. By the time you wait for your three-piece meal, fried to order in peanut oil, you'll be happy to burn your hands (and your taste buds) and dig in. Trust the Midtowners on this one: the popular, cheap, delicious Vietnamese lunch buffet at Pho Binh satisfies cravings with pho, stir fry, spring rolls, and lemongrass tofu. 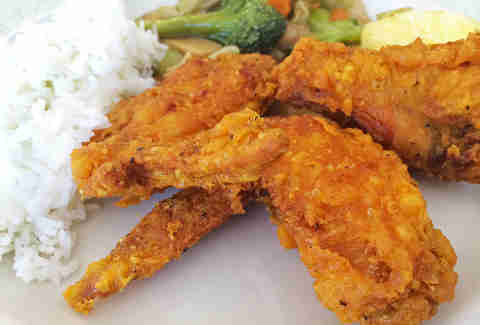 But nestled in the middle of trays of unassuming Asian veggies is a heaping platter of crispy, Southern fried chicken. The crust is a peppery, crunchy armor for the tender, steaming chicken inside. Be prepared to stand your ground, though, because as soon as they bring a piping hot batch from the kitchen, hungry regulars swarm the buffet. 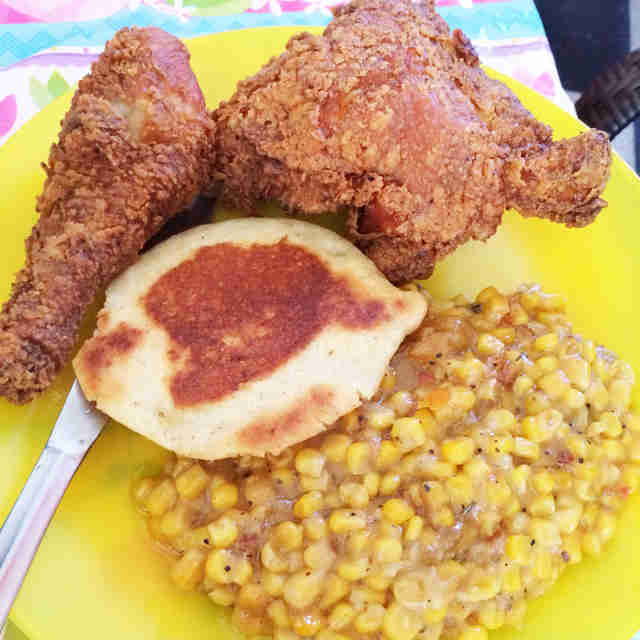 A man named Lou Martin opened the doors to Uncle Lou's Fried Chicken in 2001 to share his carefully honed family recipe for fried chicken, wings, and biscuits with Memphis, and the rest is history. Order your chicken fried with Sweet Spicy Love sauce or Homestyle (which means very hot), then wash it all down with a 44oz "bucket" of Kool-Aid. The honey butter biscuits and tenders lend themselves to constructing the perfect chicken biscuit. Come here for (as the sign says) "Love, Peace, and Chicken Grease" at breakfast, lunch, and dinner on Beale St. Miss Polly's Soul City Cafe serves up hand-battered fried chicken in the usual dark or white meat forms, or fried up with a crisp, golden waffle any day or time of the week. The Cash Saver grocery store is an interesting place. It has cheap groceries, an insane beer selection, a growler-filling station that looks like a bar, and a lunch buffet with some of the best fried chicken around. The chicken is crispy and perfectly seasoned, and moist but not greasy. Go down the cafeteria-style line and pile your plate with fried chicken and sides like okra, mac 'n' cheese, and cornbread, then pay by weight. Just be sure to get there early; especially on weekends, as eaters craving fried chicken and home-cooked soul food will form a line down the grocery aisles just to get a bite. It's safe to say Alcenia's is the only place where can you get a plate of spectacular fried chicken, served with a hug from owner BJ and a side of love, all in the shadow of an actual pyramid. Choose from dark or white meat and a slew of sides, including spicy green beans, mac 'n' cheese, and the best cabbage you'll ever have. The chicken has a classic, crisp crust with tender, juicy meat; add a dollop of secret recipe tartar sauce and you're on your way to soul food heaven. No wonder Alcenia's is considered essential Memphis eating. 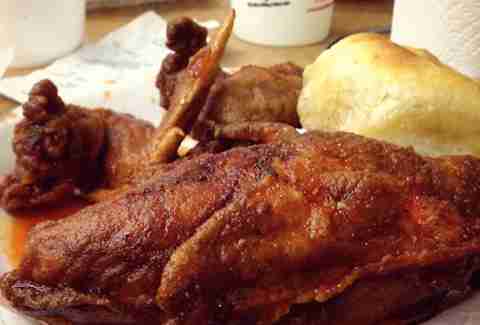 Other cities have local drive-thru fast food religious experiences, but Memphis' is top bird. 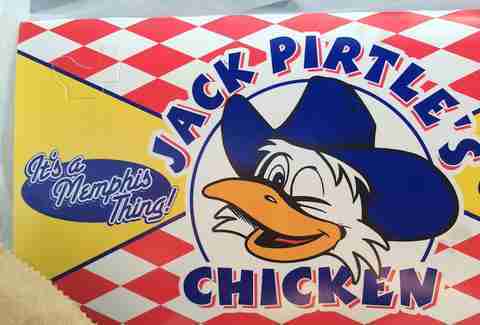 Just find the nearest Jack Pirtle's Chicken, order some fried chicken, and prepare yourself for a crispy, greasy, spiritual experience. The Pirtle family's fried expertise goes beyond breasts, wings, and thighs: its fried chicken livers and gizzards dinners are just as legendary. The important part is the gravy, which is "good enough to drink" and proves that biscuits and fries (and yes, even the chicken) are just vehicles for this nectar of the Southern food gods. The Four Way soul food restaurant is famous for at least two things: first, it was a popular meeting spot for civil rights activists from the 1940s to the 1960s, including Dr. Martin Luther King, Jr. Second, The Four Way is famous for its straightforward Southern home cooking menu. Though best known for the daily turkey and best-dressing-ever meal, the fried chicken is another staple. 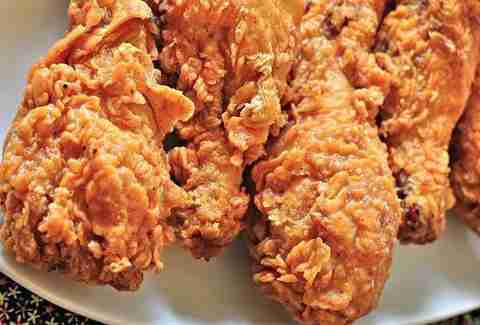 It's marinated, battered, and fried to greasy perfection... you're going to need some napkins. 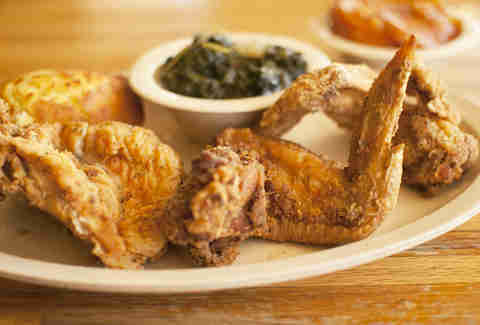 Call it soul fusion, call it old-school Southern cooking with a gourmet twist, or call it just plain delicious. 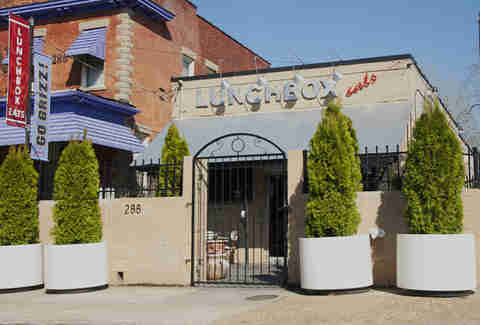 Right around the corner from the Grindhouse (aka FedExForum) on Fourth St is Lunchbox Eats. Try the killer chicken salad on cornbread along with the daily lemonade specials, house-made pickles, and of course, fried chicken. The marinated chicken is deep fried and either served with fries in a brown paper bag for your "After School Scooby Snacks," or served up between two golden brown cheddar waffles with cheese and honey mustard for the ultimate chicken 'n' waffle experience. Sweet Grass and bar-side Next Door may be famous for their towering Badass Nachos and Pimento Cheeseburger, but their wings, buckets of fried chicken, and chicken and waffles show they're just as worth visiting for the succulent crunch of deep-fried poultry. 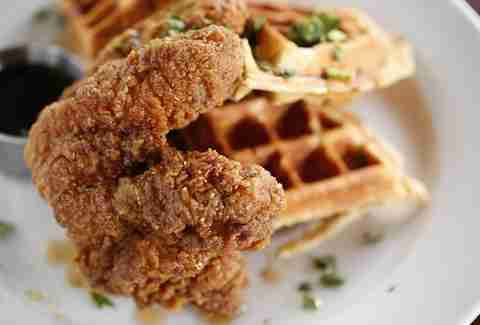 Snack on pieces piled up in an appropriately greasy bucket and sip on some local brew for while you watch the Tigers and Grizzlies, or try a pecan waffle with bourbon maple syrup on the side of your impossibly juicy fried chicken breast. 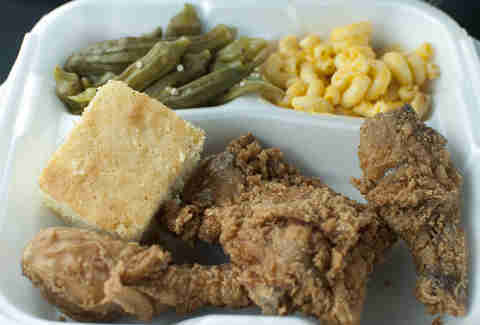 Proof that you shouldn't judge a chicken by its container: in an unassuming building down on Winchester, right in front of what's left of the Hickory Ridge Mall, is a spacious soul food restaurant called Southern Hands. 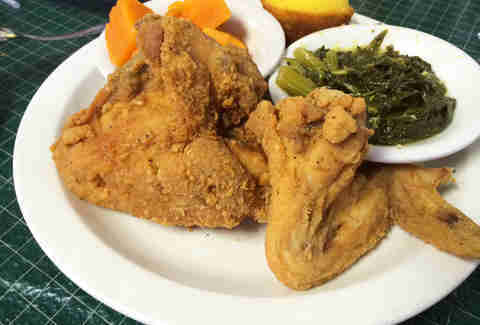 Here, you can get a huge plate of seasoned fried chicken served with a pile of candied yams, greens, boiled okra, black-eyed peas, cabbage, and more. Its hand-breaded family recipe doesn't disappoint if you're looking for crispy, tasty, tempting chicken.